Although this recipe is not so “weekly” – given my lengthy holiday hiatus – it is absolutely worth trying! 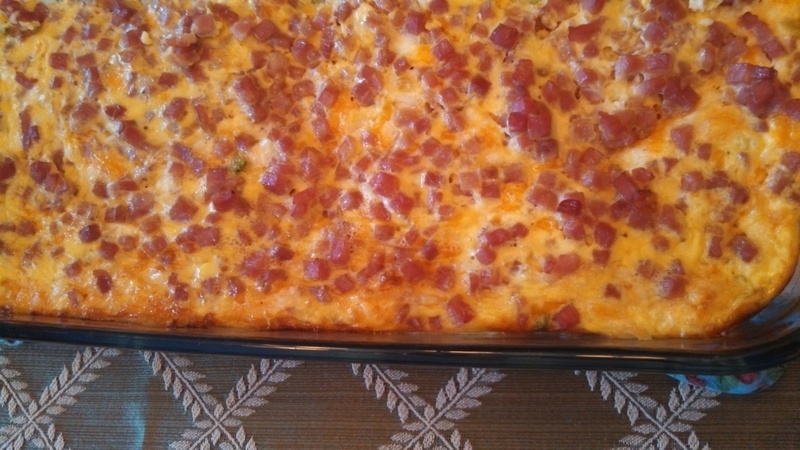 1,000 miles apart, both my mother and I dished up this tasty casserole for breakfast on Christmas morning. It comes from my long-time favorite cookbook, Recipes from the Maine Kitchen, and lived up to the cookbook’s reputation in my home for delivering easy yet delicious meals. Preheat oven to 350 degrees. 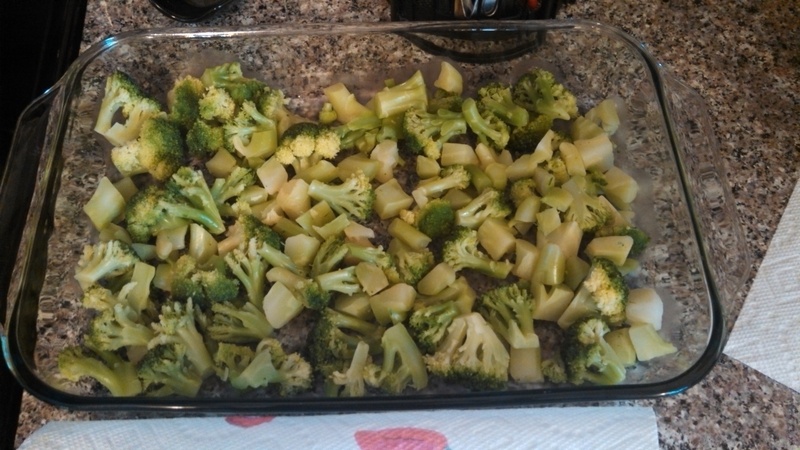 Place broccoli on the bottom of a 9″x13″ dish. Mix eggs, cheeses, Worcestershire sauce, salt, and pepper together. 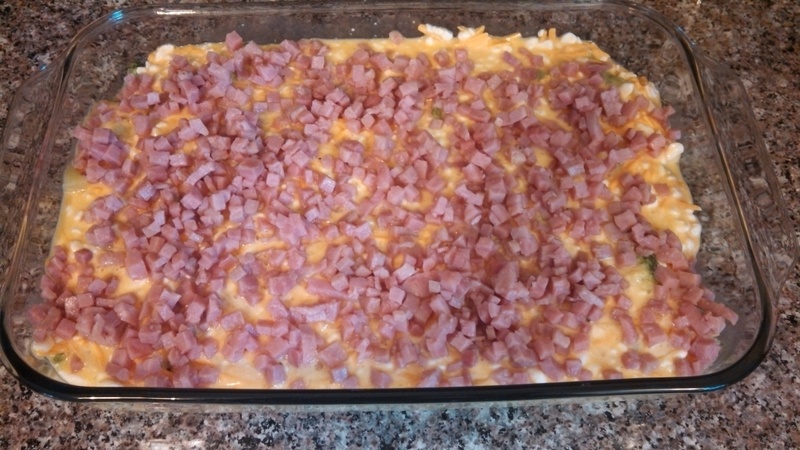 Spoon mixture over top of broccoli, and place cubed ham on top of the mixture. The recipe calls for baking at 350 for 30 – 45 minutes. When I checked it at 40 minutes, the center was still very wet. It ended up baking for about an hour – so I’d recommend planning for a longer cook time, but check carefully – nobody likes overdone, rubbery eggs. 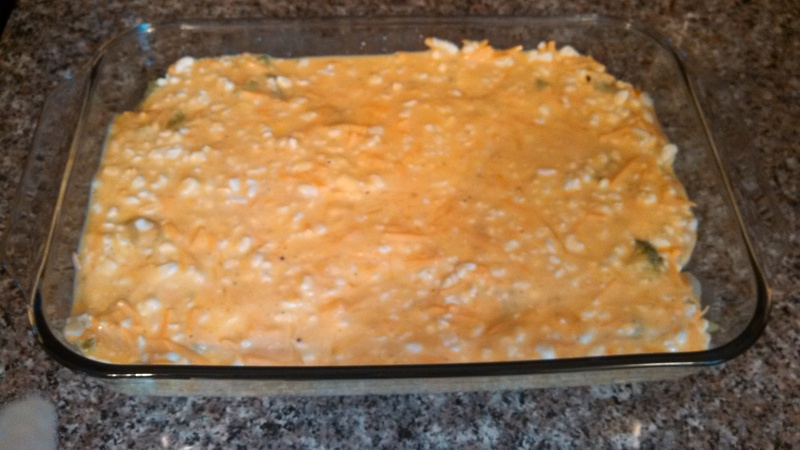 We really enjoyed this casserole – it was flavorful and filling. For a full breakfast or brunch menu, adding home fries, a fruit salad, and toast to the table would likely do the trick. We had ours accompanied by a crumb cake that our neighbor dropped off. I hope you had a Christmas as merry as ours! Best wishes for a happy 2014. Their wines include grape wines and wines made from other fruit – including plum, which is what we tried at here at home the other night. In addition to operating their vineyard and winery, they also produce maple syrup from the beautiful sugar maples on their property. Visit them in March to see the French Canadian way of making maple syrup! Their wine-making style is the result of a love for German Riesling Style wines, and most of their white wines are hybrids of the Riesling grape. The white wines include: St. Pepin, Serendipity, Clarity, By The Numbers, Edelweiss, Shorty, and Sweet Louise. Red wines include: Frontenac, Sabrevois, Jelly Juice, Misbehavin’, Marquette, and St. Croix. Fruit wines include: Blueberry Bliss, Candle Waster, Raspberry Riot, Rudy, Blackberry Bewitched, Second Chance, Blue Lightning, and Red Thunder. Their plum wine, Miz Plum, made its holiday season return just in time for my dad and Nick’s visit, and they picked up an extra bottle. I really enjoyed this wine, which I can admit came as a bit of a surprise. I typically prefer dry wines, although I do enjoy some chilled, sweeter whites on hot summer days. There is no doubt that this is a plum wine – you can smell and taste the notes of plum – but it’s very drinkable. The color is a rosy gold – I found this really interesting – it was a very pretty color with its blush notes. Although the wine was sweet, it had hints of dryness that made it very enjoyable. I could certainly see myself sitting on the deck in the summertime, with a chilled glass of Miz Plum, and maybe a nice, spicy cheese. 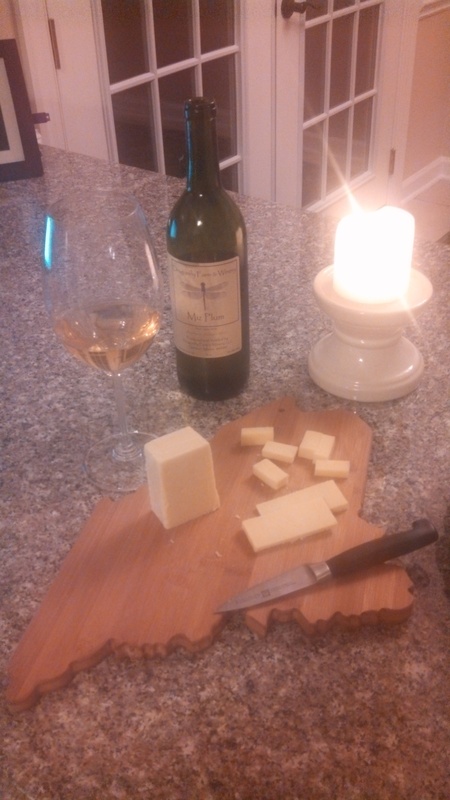 On another note, the Maine-shaped cutting board pictured above is made of bamboo (a renewable resource) and was a gift to us from my best friends – the lovely and talented Emily and Elisabeth! 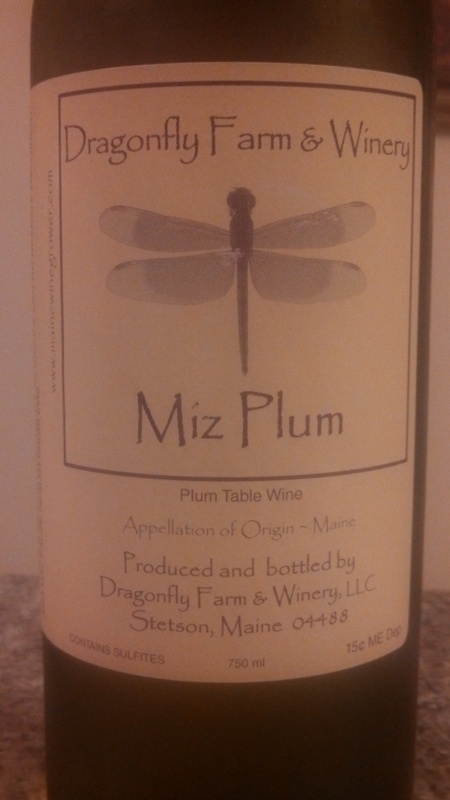 Categories: Drink, HoME Grown, Shop | Tags: Dragonfly Farm & Winery, locally grown, Maine, maple syrup, red wine, vineyard, white wine, winery | Permalink.